I work with 100% natural light for all portrait photo shoots. Natural light is my inspiration and I admire it for its beauty. My photography approach is "relax and casual". With a combination of pose and candid moments, my goal is to capture the TRUE YOU. I always strive to capture unique and soulful images of your children and family. Your child's natural actions and movements, personality, their expressions, emotions and moods are the main elements of my focus. I love the sincerity and honesty of the child's heart, which can be seen through their eyes. I believe they play important parts to form priceless and meaningful images. I also love to have a direct eye-contact with my subject. "EYES are the gateway to the SOUL". Therefore, it is important for me that you and your family feel comfortable during my session. Just enjoy and relax, and let your children be their natural selves. The more relaxed and happy you are, the better it would work for everyone. I do not have any specific rules or expectations, but I will make sure that in the end you will be happy and amazed with the beautiful portraits and memories you will have; the ones that you will treasure for many years from now. I treat your children as my friends. At the beginning of a session, I will usually have an 'ice breaking' session with your children to make them feel comfortable with me. I will start to photograph them along the way. Please, please do not force your children to pose or smile at the camera as they would in return fake a smile or pose. It is absolutely okay if they do not want to pose or smile, and it is completely fine too if they do not show any interest to what is happening around them - as long as they can be themselves. Let the children be children. Let them explore everything around them. To me, every child is special. I have my own ways with little ones and I have never failed to charm my way into their hearts. More than often, the children would get very comfortable with me in no time and they would be more than happy to look at me in the eyes. During your session, you will find me chasing your children, play hide and seek with them, rolling on the grass with them or even help them to change their clothes. In my session, your children will have freedom to run, jump and play as much as they like. While the rest, let me capture them in their most natural ways. For a child's individual portrait, I prefer to work one-on-one with them, with the parent off to one side. The main reason is so that the child could establish a special connection / bond / trust with me without having them being controlled by parent(s), who would normally try to make sure their children behave in certain behavior: such as not to exhibit their funny smiles, their little quirks and so on. In my experience, when the children are separated from their parents, this expressions rarely occur and better photographs can be captured. At the same time, the parents are able to relax and watch their children having fun. 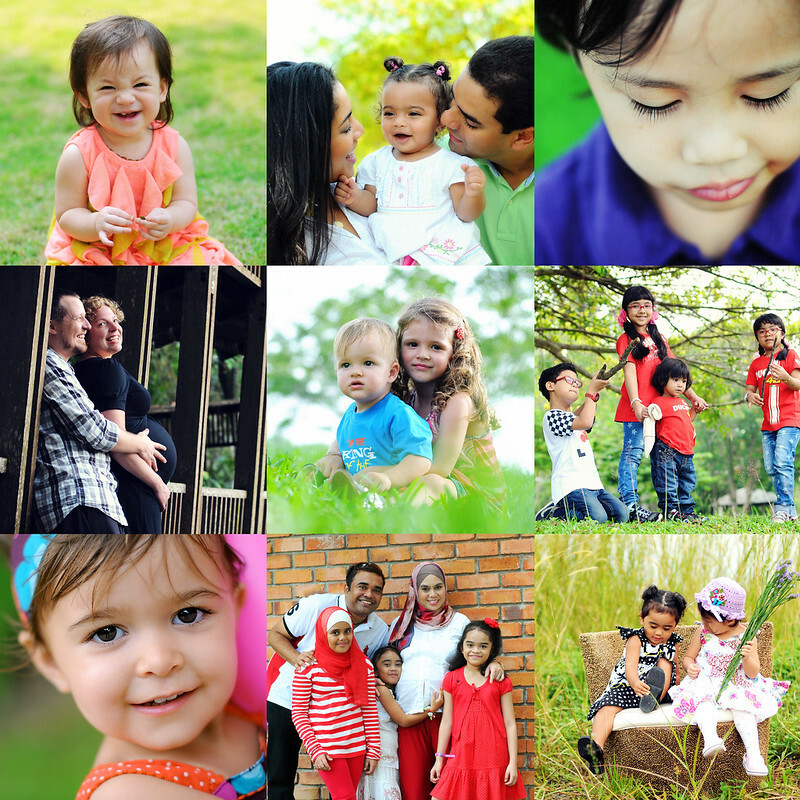 For family portrait, my aim is to capture the bonding, connection and relationship between the children and the parent(s) and also the siblings. So just relax, be the real you and enjoy the moments you spend with your loved ones. The more you can pretend that I'm not there with you, the better. At the end, I want to provide you the beautiful images of the real and honest connections and bonding between you and the children, and this kind of images will remind the children one day of how much they are loved. As for the clothing advice, I would suggest you to wear anything that you feel comfortable with. If you are comfortable with jeans, t-shirt and sandals, just wear them! Remember that my aim is to capture you just the way you are. So do not hesitate to just BE YOU :-). Nevertheless, please try to avoid clothing with large logos, or stripes, as they often distract/overshadow the child in the photos. For family, although it is not necessary, resembling tone coloured outfits are highly recommended. Many clients have been asking me about the props. My photography style; both - for studio & outdoor session are simple and minimalis with minimum use of props. I believe with 'less is more'. I normally bring my props only to shoot newborns. For outdoor portrait, you are encouraged to bring your own props such as your children's favorite toys, blanket, or something that is very attached to your child, or you can also bring something that could give a sentimental or certain value to you and your children. BUT not too many of them, as the main subject here is your child / family. The props should be used just to add story to the photograph. Last but not least, please take enough rest prior to a session. Make sure everyone has taken their meals (breakfast / lunch - depending on your session) before a session. Please do not forget to bring some drinks and maybe some snacks as the children or even adult may need this during the session.